Billy Ray Cyrus is coy about daughter Miley Cyrus and beau Liam Hemsworth's plans for the future. After breaking off an engagement in 2013, the two rekindled their romance earlier this year. Sources later told E! News in January they had gotten re-engaged and Miley, 23, has over the past few months been spotted with Liam, 26, and his family and has also been wearing what appears to be the engagement ring he gave her the first time. 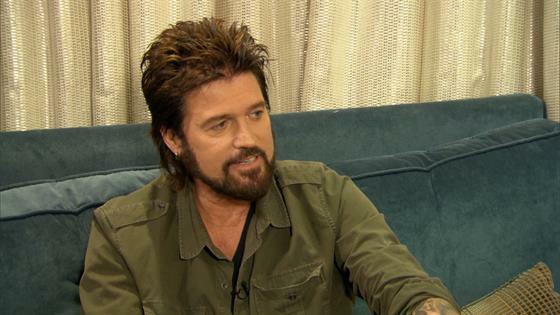 When asked if the two are officially engaged, Billy Ray, 54, told E! News' Carissa Culiner exclusively, "Here's what I do know. They're so happy. That's the main thing." "Miley and I, we always had this slogan—'If you ain't happy, it ain't working.' Just seeing these—I still call 'em kids—these two kids happy, that's all that matters." Miley and Liam have not commented about their rekindled relationship. If they do end up marrying, Billy Ray is ready to perform any wedding duties they'd like. "If any of my kids decide that they're gonna have a wedding of any kind, whatever role they want me to play, I'll be there, you know what I mean?" he told Culiner. "They want me to be the butler—that's fine. Whatever they choose. I might make a good preacher." Meanwhile, Billy Ray has another elaborate, far less personal, star-studded event to prepare for: The 2016 CMT Awards, which take place June 8. "I'm going to do something at the awards," Billy Ray told Culiner. "I'm real excited about it. Country music is in a great spot right now. There's a lot of great talent out there." Billy Ray and Miley had co-hosted the CMT Music Awards in 2008, three years before their Disney Channel series Hannah Montana ended its run after four seasons. Billy Ray is set to make his big TV return with the CMT comedy series Still the King, which premieres on June 12.